Admission is based on the applicant’s academic training, professional background, personal statement, and professional and academic references. Strong candidates will possess an excellent academic record and serious interest in experiencing legal education at a superior educational environment. Students in the LLM program should be prepared to read and discuss in class difficult technical material. Non-native English speaking LLM students are examined separately from the JD students in their classes. All LLM students are graded separately from JD students in the same class. Daily class preparation is demanding. Students with English language limitations may have difficulty. Only students who feel confident in their English language ability should apply. For this reason, the TOEFL (Test of English as a Foreign Language) is required of foreign applicants seeking admission from nations in which English is not the primary language of instruction. A minimum TOEFL score of 600 on the paper-based test, 100 on the Internet-based test, or 250 on the computer-based test is expected. 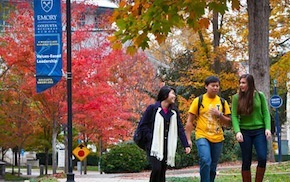 Emory Law also accepts scores from the IELTS examination; a minimum score of 7.0 is expected.